Charles Edward Turnbull's company was founded in 1872 in London, England. They are probably best known for their doll houses and miniature furnishings and toys, some of which were imported, they also made or sold golliwogs, toy soldiers trenches and forts. Turnbull's trade name was Charterhouse Toys, as they were located at one time at 4 & 5 Charterhouse Road. CE Turnbull had two sons, both of whom joined him to work in the store. The store is believed to have closed in 1963. 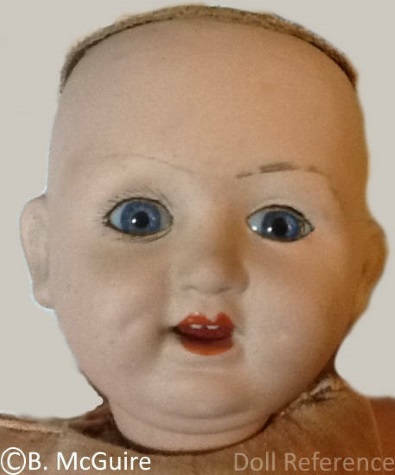 Shown at left, is a Turnbull doll, she has a bisque socket head, single stroke painted eyebrows, glass sleep eyes, lightly painted upper and lower eyelashes an open mouth with two upper teeth. She has a cloth stuffed torso with composition arms and legs. Doll is marked on back of neck CETANCO as shown below.